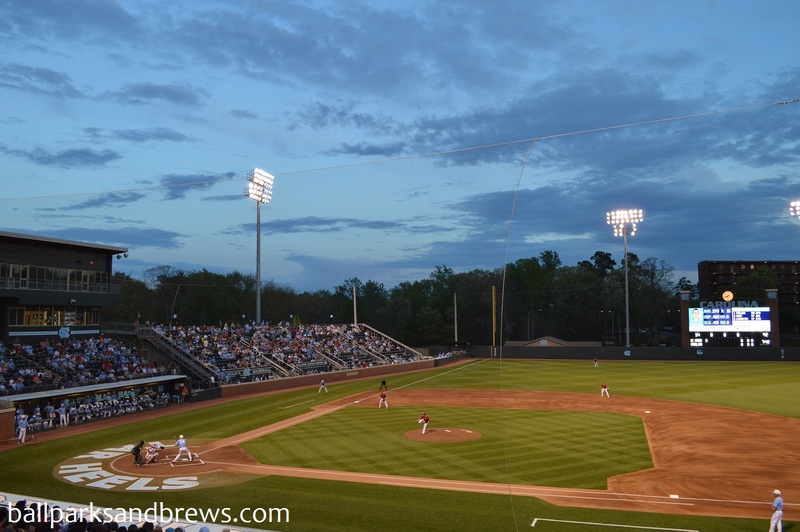 Ballpark Basics: A ballpark that shows the ACC is not just a basketball conference. Situated in the heart of UNC’s campus, Bryson Field at Boshamer Stadium will make you realize that the Tar Heels are not just a basketball school. 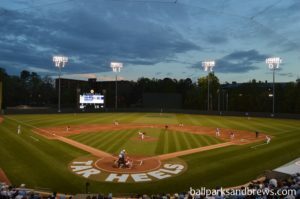 We were lucky enough to catch an ACC match up against NC State and learned first-hand the Tar Heels take their baseball just as seriously. The seating bowl is awash in dark green seats and the club level that rises above the grandstand continues this theme. 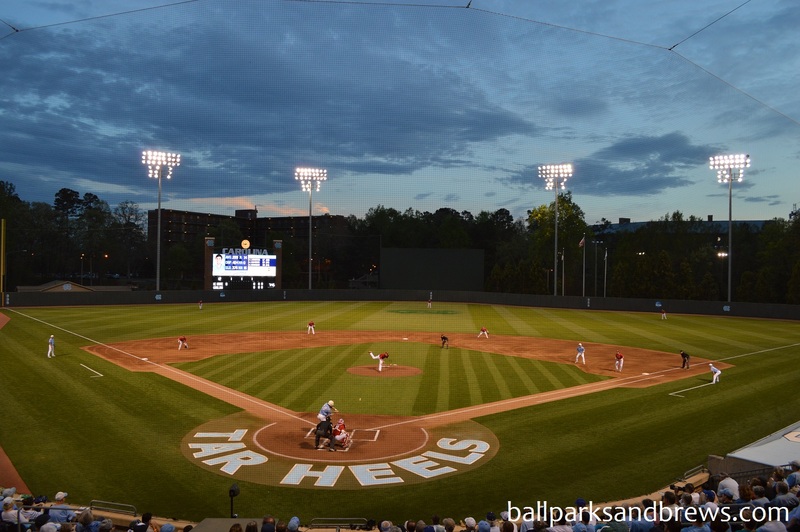 There of course are elements of Carolina blue sprinkled throughout the ballpark (from the top of the dugout to the logo behind home plate to the scoreboard). Of course the majority of the fans are also covered in Carolina blue gear. 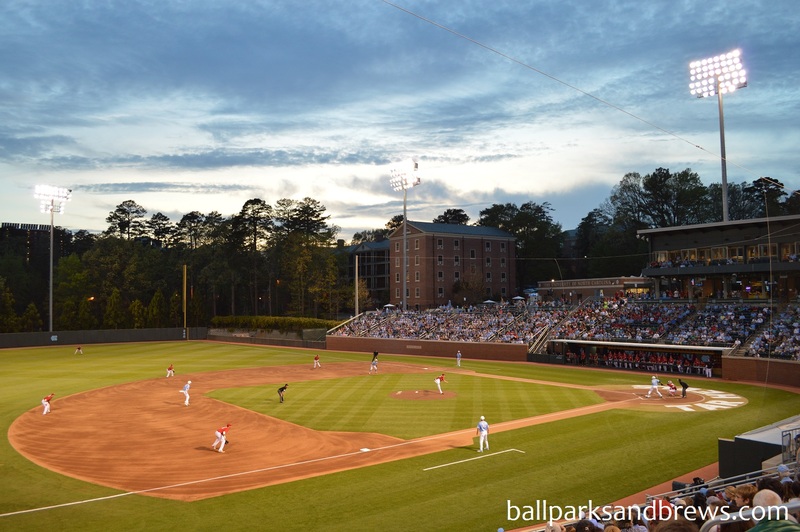 Carolina baseball is not short on history and the school does a great job of incorporating it throughout the ballpark. There are plaques throughout the concourse highlighting conference championships, College World Series appearances and instrumental players through the history of UNC baseball. However, the Hall of Honor really puts the team’s history on display. Here they have memorabilia from past players, videos from their CWS appearances and lists of players that have been drafted in the MLB draft. All of this in an air-conditioned suite that overlooks the field so you can still watch the game while browsing. 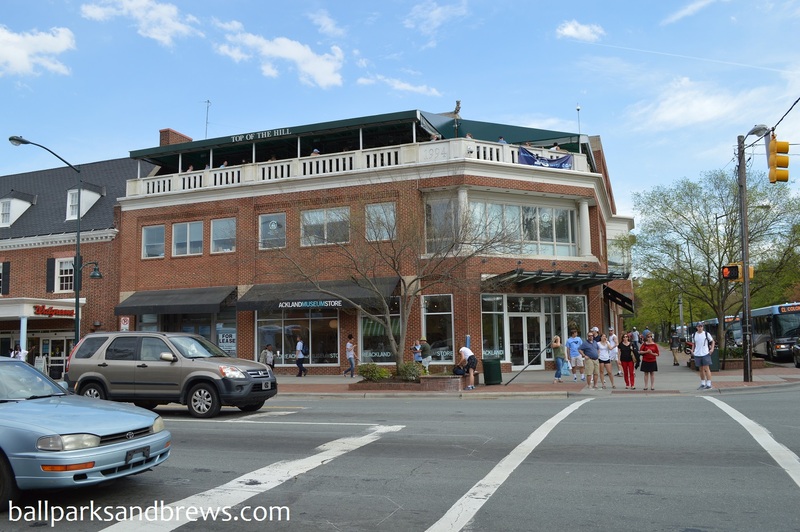 BEST SPOT FOR BEER: Since Boshamer Stadium is on the campus of UNC there are no alcohol sales allowed. 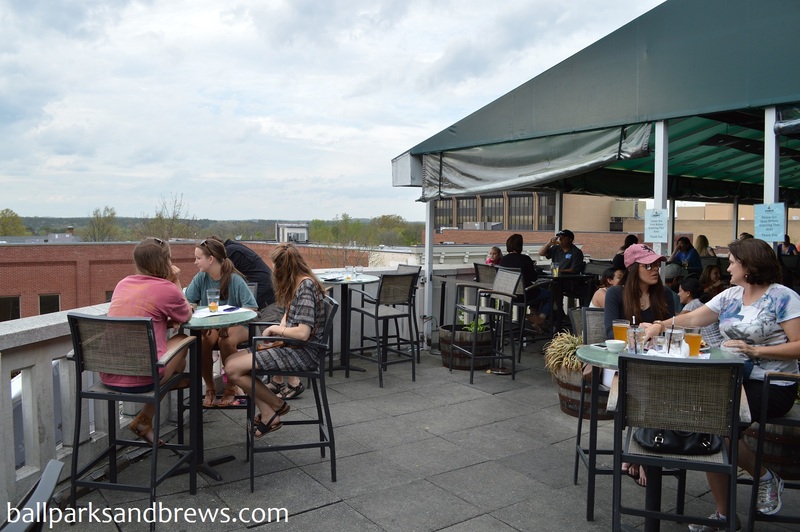 However, you are a short walk from downtown Chapel Hill with a wealth of options for local beer including Top of the Hill (see below). Most people equate UNC (and the ACC as a whole) with basketball, with good reason. However, after taking in a game at Boshamer Stadium their baseball team offers an atmosphere that rivals that of any college game we’ve been to. Brew Basics: Medium beer, great deck. This is an interesting building with a great view. The inside is hostess seated and has a large bar but the main draw of this restaurant is the huge rooftop deck. Divided into two, a large covered part is hostess-sat and only for those ordering food. The other third (give or take) of the rooftop is treated like a bar with bar top tables with first-come first-served seating. 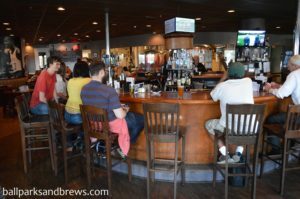 Overall, we found the beers to be typical, but there were a few standouts that make it worthwhile. Hands down, the best part of this place is the view from the deck and the people watching that comes with it. Brewery Breakdown: The wind was blowing furiously the day we were there but that didn’t stop us from trying a whole mess of options. 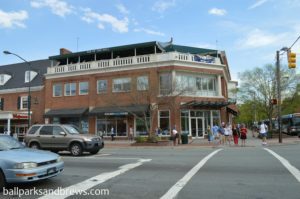 Despite the wind and a packed house, TOPO’s staff took the time for good presentation and two were even topped with fruit. A signature move with this brewery is that each beer has warrior hops. Kenan Lager: 4.2 ABV /15 IBU A very light yellow almost clear beer. Smelly almost stinky hop scent with an earthy flavor that ends dry, with distinct hops. Blueridge Blueberry Wheat: served with actual blueberries in it. The aroma is a very mix of blueberries and wheat and the palate is a very floral blueberry that finishes light and crisp. Surprisingly good, this is their most popular seasonal. Old Well White 6 ABV /12 IBU very similar in color but slightly more in the orangey wheat beer color. Served with an orange slice and has a strong orange smell and strong orange taste. Sweet upfront and kind of syrupy with a sweet end. Very citrusy that is tastes chemically orange and overpowering. OC Collab Ale 5.8 ABV /34 IBU This is a neat idea that is a collaboration of all five Carolina OC breweries. Light malts, solid hop bitter finish in this pale ale style beer. Hoppy aroma and red lager color. Plott Hound Pale Ale that smells a little sweeter than the straight hopped OC Collab. While still a hoppy beer, the hops here are more muted and there are rye notes. The rye adds an extra dimension to this single hop, single malt beer that is visibly carbonated and finishes crisply. Coker Coconut Porter 6 ABV /28 IBU This is a very dark almost black colored beer with a layer of tan head. It took a second to get the aroma but it’s malty with hints of coconut. The palate is a malt front and strong chocolate and most of the coconut is in the end and a malt finish. Smooth, served warmer than the others. 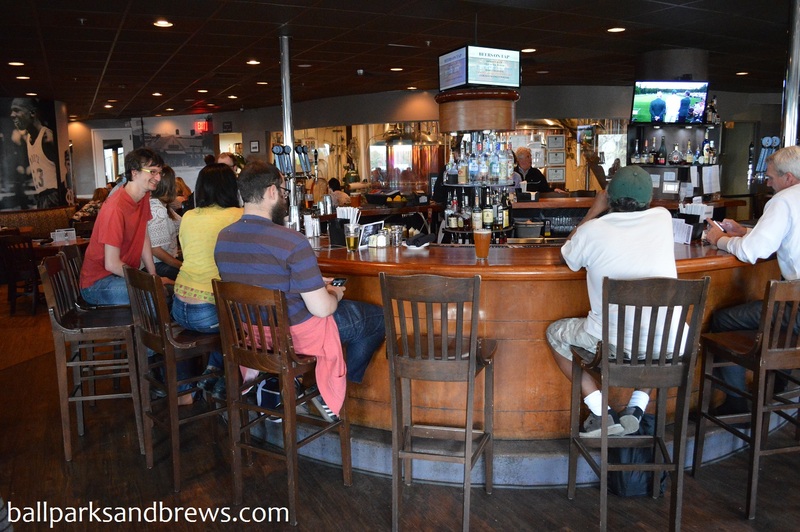 Not on the tasting menu list was a cask ale rotation strong ale aged in whiskey barrels. Orange in color with a sweet wood, whiskey smell and a thick feel. A flat taste with scotch spices but with even additional liquor but it’s not cloying like lots of imperials. Tart with a whiskey end.